My cooperating teacher put together these math boxes which contain 20 math cubes (10 in each color), 20 counters, dice, and cards numbered 1 – 20. 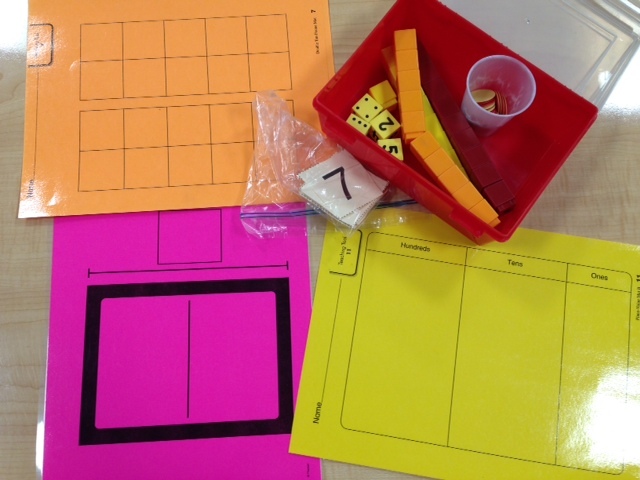 Our first graders use them daily and often use laminated cards as well to build ten frames or part-part-whole models. (She also has place value cards which we have not needed to use yet). The standards these first graders are expected to meet are challenging, and new concepts are often presented before they have had time to automatize the previous ones. Using these manipulatives and tools has really enabled these six and seven year olds to develop a true number sense and have reference points for how to begin when concepts stretch their thinking. I especially see the power of the students’ visually representing math and being able to move numbers themselves to show the action happening within equations through watching the growth of a student who transferred into the class mid-year. This student had a lot of facts memorized, but we soon realized a deep understanding of the part-part-whole model and the equal sign meaning “the same as” was lacking. Just this week, as we looked at addition and subtraction fact families, this student went from having no idea how to write the subtraction sentences when written in part=whole-part order to being able to build models of the fact families on a board and then transfer the parts and whole into subtraction number sentences. These tools will definitely be used in my classroom next year! Part of the Process’ blog and her reference to Jennifer Orr’s blog both have me thinking about the degree to which classroom community is linked to the teacher. The teacher should orchestrate the building of the community at the onset of the school year and facilitate the ongoing maintenance of it, but it should not fall apart when the teacher is not there. How in the world do you ensure this does not happen? I don’t have the answers yet, but some thoughts I had while reading the article “Talking in Class” by Johnston, Ivey, and Faulkner, for my literacy teaching methods course come to mind. The students in the classroom referred to in this article have been taught through modeling by the teacher how to have classroom discussions and one on one conversations in such a way that evokes thinking and debate, all of the while maintaining respect for one another and a safe atmosphere. Similar focus on non-judgmental language and open ended questioning being used to both further learning and create a safe atmosphere for exploring and failing on the often bumpy road to success are explicitly written about in Classroom Discussions: Using Math Talk to Help Students Learn. “The notion of community is not simply about such things as . . .negotiating class plans and policies . . If we intend to capitalize on the possibilities that social spaces offer for learning, we can say things to help children attend to each other, see each other as resources, and build relationships” (2011, Johnson et. al, p.237). In other words students need to be responsible to one another in a strong learning community, not just to themselves and their teacher. A blog about the ups and downs and all arounds of becoming a teacher! Thoughts on becoming a teacher.